My husband buys mints for me to keep in my purse. He does this so that when he asks, "Got any mints, Sweetie," I will have the mints to place into his hand. I thought about this yesterday as we were traveling to our first of three services and he asked the expected "mint" question. It reminded me of another provision. The Lord Jesus gives to us as believers absolutely everything He could ever ask from us. In fact, in some way I can't truly understand, but chose to believe by faith, He is actually the provision for everything we will ever need. There is nothing we need that He has not already supplied with Himself, for having Him, we have all. My husband and I had decided to have one of our favorite lunches, shrimp and grits. Now, we make a mean dish of shrimp and grits, dividing the responsibilities for the components between us. My husband is in charge of the shrimp. He perfectly blends the cajun spices, lemon juice, butter and garlic then sautes the shrimp until they are tender and a beautiful pink. The grits are my domain. Coloring the water with enough butter to make Paula Dean proud, the secret is to constantly stir them until they are soft and creamy, creating a perfect bed for the shrimp to rest upon. We enjoy standing side by side at the stove as we each work on our own part of the dish. 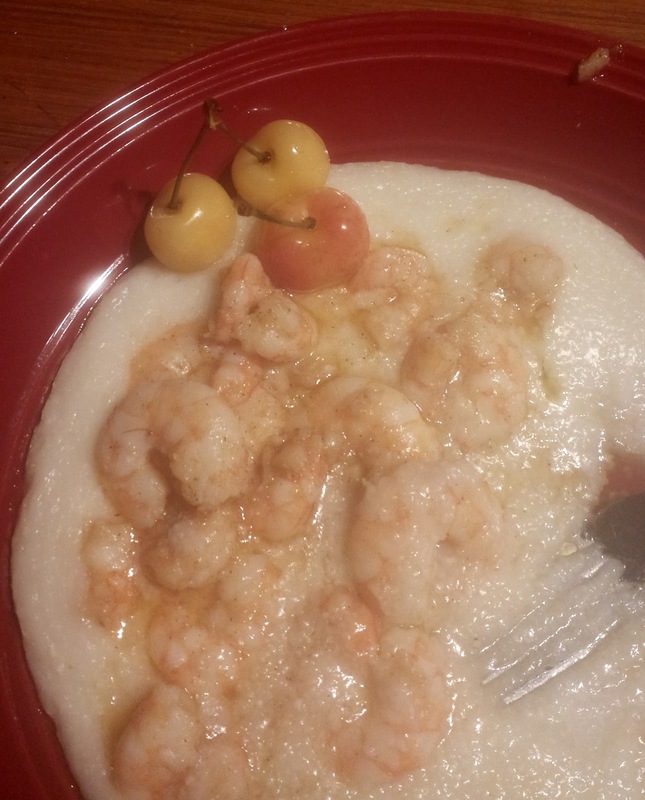 When we have timed things correctly, the shrimp are ready just as I have finished pouring the grits onto the plates. This day, however, we realized we had one small problem. We had no grits. "We can't have Shrimp and Grits without grits," my husband said. "No," I answered, "You can stir that water all day long and it won't make grits if you don't have any grits in the pot." Immediately as the words left my mouth I thought of a deeper truth they represented. Many people who label themselves "Christian" try to make a "Christian life" by their activity, by their good works, by the things they do. They only have one problem. . .they don't have grits in the pot. They don't actually have Christ residing in their hearts. They have never entered into that personal relationship in which they accept the Lord Jesus Christ as their Savior and Lord. As we sat at the table, we thoroughly enjoyed our lunch. The shrimp were incredible, just spicy enough and with that hint of the sea fresh seafood imparts. The grits were smooth, buttery and creamy. The yellow cherries we had with them were sweet and soft. It was a perfect lunch, but it reminded me of a more perfect truth. It is the Person who lives in us who makes us what we are as Christians, not what we do. He works in us to "will and to do of His good pleasure." So before you start to stir the water of your life, make absolute certain the grits are in the pot, or else you are just wasting time and energy and there will be no wonderful meal to set on the table. With a history of being big "Superman" fans, my husband and I went recently with our daughters to watch the movie, "Man of Steel." I was intrigued that Clark Kent's father was portrayed as impressing upon him that his character was more important than his super-human abilities. This echoed the sentiment I had heard in a sermon recently, "With God, character trumps capacity." What a profound thought. God has the ability to do anything. . .anything, but purposefully limits Himself to that which is consistent with His nature and character. The Lord Jesus lived thirty-three years upon this earth and never once sinned. He never once gave in to the temptation of selfishness. God never has and never will have a selfish inclination, He is always for others, He is always for us. For Him the who is more important than the what. As amazing as all of that is, it is even more amazing that this is the very type of person He is in the process of conforming us to be. He is conforming us to the image of His Son. . .conforming us to that life of total selflessness, total for-other-ness. Now that is a super-power. Probably every American since 1939 is familiar with this sentence. 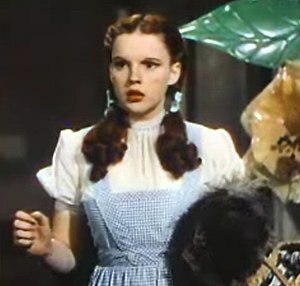 Dorothy repeats it to herself in the movie "The Wizard of Oz," tapping her ruby slippers together as the formula to send herself back home to Kansas. As beautiful and magical as technicolor Oz has been, all Dorothy has wanted since her windy arrival is to return to black and white Kansas. You see, even when home is black and white, it is still "where the heart is." Or as I heard it described once, "home is where they have to let you in." As Christians, we often feel out of place in this world in which we live. The prevailing sentiments of society often seem to run against our beliefs and values. The laws of the land even sometimes seem to turn away from what the founding fathers intended when penning our most basic tenets. But we need to remember that we, like Dorothy, are just visitors here -- as she was in Oz. We are citizens of another city, a better city. Our true home, our dwelling place is heavenly for the Lord Himself is our dwelling place. The Scriptures also tell us that "in Him we live, and move, and have our being; (Act 17:28.) We are always "in Him." There is no where we go that we have out-run the borders of the dwelling place of our Lord. We are always safe within His realm, we are always under His watchful eye, His protective care. As His child, we are always "home." 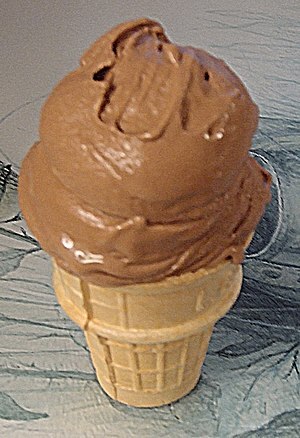 When we go to our local ice cream shoppe (and I love the use of the old fashioned word "shoppe,") I always order the sugar-free chocolate ice cream. I do this for two reasons. Primarily, because my body doesn't tolerate the insulin produced as a response to sugar in my bloodstream. My body still makes insulin, and I want to keep it that way, but my cells are resistant to insulin and don't want to let it in to do it's job. The main reason I order this particular ice cream, however, is that it is actually better than the original chocolate ice cream the shop sells. If you didn't know it was sugar-free, you would never guess it. The texture is creamy and smooth and the flavor is absolutely perfect. It is better than any I have ever tasted. I choose the sugar-free mostly because it is better. "For the law made nothing perfect, but the bringing in of a better hope did; by the which we draw nigh unto God. And inasmuch as not without an oath He was made priest: (For those priests were made without an oath; but this with an oath by Him that said unto Him, The Lord sware and will not repent, Thou art a priest for ever after the order of Melchisedec:) By so much was Jesus made a surety of a better testament. And they truly were many priests, because they were not suffered to continue by reason of death: But this man, because He continueth ever, hath an unchangeable priesthood." He is better than anything else we could ever be offered anytime, anywhere else in our lives. There is no choice that will ever compare to Him, and we do well to choose Him while we may. Nothing I desire compares to You. 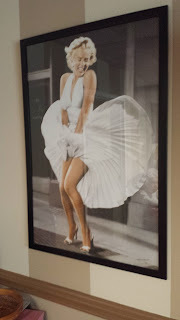 In the Activities Room where we do services at a local retirement community, there is a poster of a very famous picture. The person in the picture is famous and the pose is famous. You will recognize it immediately. 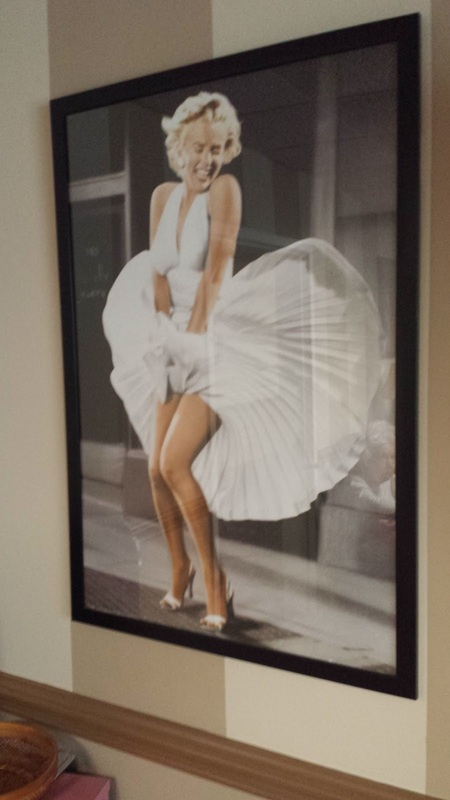 The picture is of Marilyn Monroe during the shooting of the film, "The Seven Year Itch." The picture gives the illusion that a photographer spontaneously snapped a photograph of the famous blonde just as she stepped onto the subway grate on the corner of Lexington and Fifty-second Street in New York City. As it turns out, however, everything about this particular famous picture is an illusion. Nothing is actually real about it. First of all, the snapshot was not spontaneous. There were actually two shootings of this famous movie scene. One was done on September 15, 1954 at 1 a.m. at the New York location. It was well publicized ahead of time so there were many photographers and hundreds of fans present. The film's director, Billy Wilder, took the actress through a series of warm-up poses over the subway grate before filming ever began to make sure she knew the physical aspects of the scene. The blast from the subway was not generated by a passing train, but instead by technicians underneath directing fans toward the star's legs. Fifteen takes of the scene were made with her dress flying in the wind of the blowing fans below. Her dress was blown high above her waist, revealing her white underpants, which in that day was considered scandalous, and showed the public --and waiting photographers -- much more of her than they had ever seen before. The scene was filmed again on January 9, 1955 on a set at the 20th Century Fox lot. In this scene, and the resulting picture we see here, the actresses' dress never rises much more than above her knees. It took over 40 takes to achieve the final scene. The famous "white dress" we see in the picture wasn't actually white, it was ivory. Stored away by the designer for years, the entire collection was eventually purchased by Debbie Reynolds, who said the dress had yellowed to a ecru color by the time it came to her. When last purchased just the dress itself sold for $5.5 million dollars. That isn't the only illusion in the picture. Marilyn Monroe was not born a blonde. She changed from a brunette to a blonde (I can't fault her for that) because blondes were more in demand as actresses then. Lastly, Marilyn Monroe was not born Marilyn Monroe, but Norma Jean Mortenson, and almost immediately renamed Norma Jean Baker. The name Monroe was chosen because it was her mother's maiden name and Marilyn because of the alliteration it provided. There are many things this world tries to present to us as beautiful, desirable and worthy to be had. But when we look closely, examine them by the light of truth, we will see they are illusions. We do well to seek for that which has been proven to be true and right and faithful, knowing they will never fade, they will never yellow with time, they will never disappoint us. As I heard someone say one time, "Only God and people are forever, everything else is just stuff."